Monoclonal antibodies (mAb) are powerful tools which are widely used in every phase of the biomedical field from discovery research and diagnosis to therapeutics. Yet, existing methods for isolating mAb-producing hybridomas are tedious and time consuming and often not amenable to high-throughput screening. In particular, the most challenging, time-consuming, and labor-intensive phase in generating mAbs is the Limiting Dilution Subcloning (LDS) step. During this step, fused hybridoma cells are added to microtiter plate wells containing media supplemented with HAT (hypoxanthine, aminopterin, thymidine). Following selection, hyridbomas are screened for reactivity (using methods such as ELISA) and processed through cycles of LDS until a positive cell is found to be clonal. Prior attempts to improve the process have lacked efficiency and are often cost prohibitive. 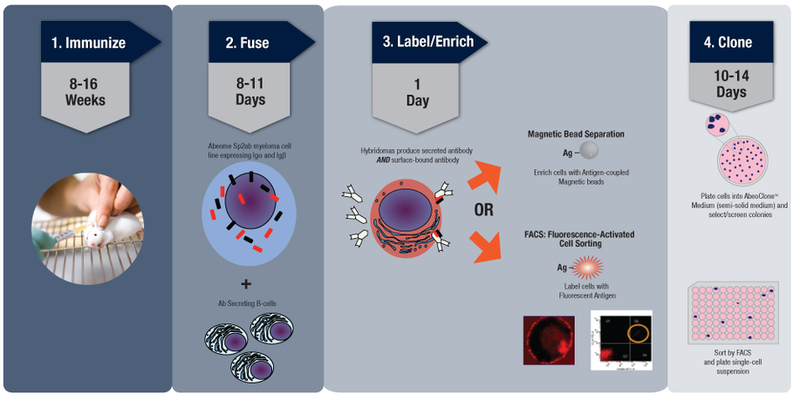 The Direct Selection of Hybridomas (DiSH) kit is a novel system in which mAb-secreting hybridoma cells co-express significant amounts of the membrane form of the secreted immunoglobulin (Ig) on their surfaces. Subsequently, hybridomas with high-affinity for the target antigen are labeled. And once labeled, these hybridomas can be isolated from among a pool of hundreds of thousands of cells in a matter of hours using Fluorescence activated cell sorting (FACS) or magnetic separation. The total elapsed time from harvest to the first screening is typically 16 days, resulting in improved efficiency for detection of highly specific mAb. Download the Application Note: Anti-hESC mAb Hesca-2 Binds to a Glycan Epitope Commonly Found on Carcinomas. Introducing two new cloning media, ABEOCLONE™ Base Semi-solid and CHO TCSC Semi-solid media, for creating stable mouse hybridomas or CHO cell lines. How Does the DiSH™ Technology Work? 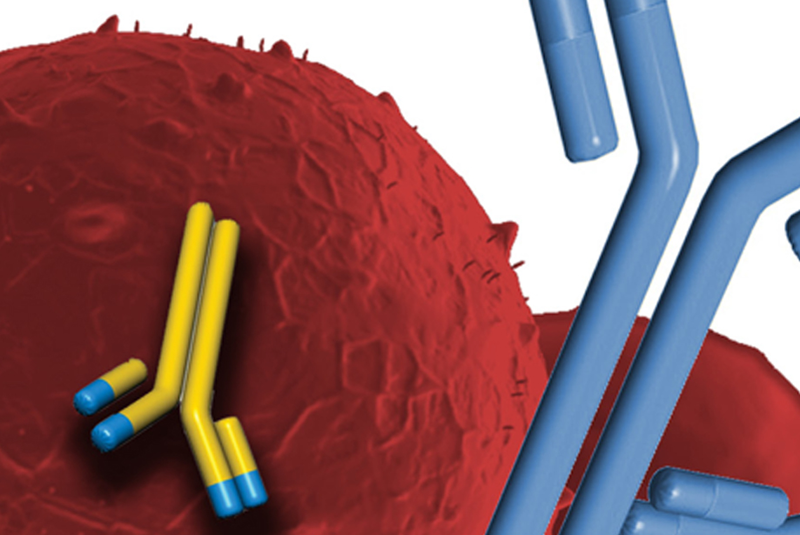 The isolation of antigen-specific hybridomas is performed through a four-step procedure. LABEL/ENRICH: Antigens are conjugated to biotin to enable capture of antigen-specific hybridomas. Hybridomas can be fluorescently labeled for use with FACs or separated by magnetic beads. Magnetic bead separation: cells plated into AbeoClone™ Medium (semi-solid agar) are examined for the presence of visible colonies.